Good news for Gmail users: The service’s web portal just got new customization features. According to Gaurav Vijay the Official Gmail Blog, Google has added new themes and customization options along with support for emoji. Here's what you need to know about the update. 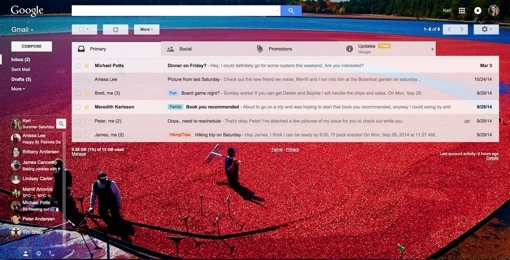 Gmail themes are a simple way to customize and add personality to your Gmail webmail sessions. Accessed through the Settings icon located near the top right of your Gmail window (the cogwheel), the key component of every theme is the background image used behind your inbox. Today’s update brings a wealth of new photo options, from majestic mountain scenes to close-up photos of a sandwich. 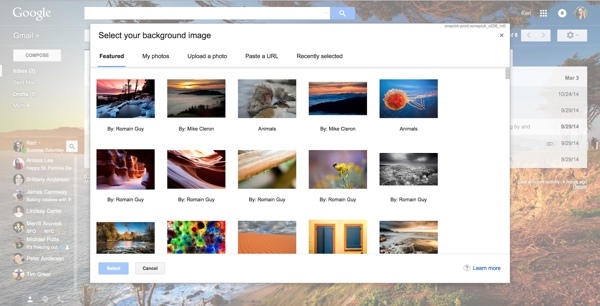 And if you don’t like any of the themes provided, Gmail provides you the option to upload your own theme images. Themes are more customizable than before, too. At the bottom of the main “Pick your theme” screen window you’ll notice new menu options. The Vignette slider allows you to make the corners of your theme darker, while the Blur slider lets you control how sharp the background image is. The Text Background icon lets you choose between white text on a dark background and dark text on a light background. Once you’ve gotten the perfect theme setup, you can share it with friends via the “Share your theme” option, also located under Settings. My friends and I have fallen in love with emoji, tiny pictographs commonly added to text messages. Now, Google Gmail supports emoji use too, allowing you to add a dash of fun to your email messages. Just keep an eye out for the new “Insert Emoticon” menu option at the bottom of your Gmail compose window. Google says these updates are rolling out over the next few days, so if you don’t have these cool new features yet, be patient. To learn more about these new additions to Gmail, check out the Official Gmail Blog. For more cool Gmail features, take a look at these 5 tips for getting the most out of Gmail and be sure to read up on the new Undo Send feature to retrieve accidentally sent emails.